quite useful in entering, editing, analysis and storing of data. financial, mathematical and statistical formulas. new item is added to the end of a list. and repeated text. AutoFill can also be used to copy functions. You can also alter text and numbers with this feature. more. With these shapes you can draw your own graphs. and text by simply dragging the data with the help of mouse. analyse complex data relationships graphically. 2. Highlight the Programs item. The program menu will open. Symbolically these actions are shown below. shown in figure 12.1 to start your work on Excel. either text, numbers, or mathematical formulas. screen and allows you to quickly access basic Excel commands. or click the New button to create a new workbook. or CTRL+S, or the Save button on the standard toolbar. 4. Print - Click the Print button to print the worksheet. be explained to you later in this lesson. Redo arrow to cancel the undo action. text to link to and click OK.
are discussed in lesson 15.
and type the text. Press ENTER key to finish your text entry. calculations with these kind of data entry. same value or with a series of values with the help of AutoFill. 2. Select the cell and simply retype the correct entry. cell and press Delete key. Insert→Worksheet from the menu bar. row label, right-click with the mouse, and choose Insert. umn label, right-click with the mouse, and choose Insert. ing to the column you want to resize. the row or width of the column. bar or click the Copy button on the standard toolbar. Paste button on the standard toolbar. those headings will disappear as the worksheet is scrolled. main frozen at the top of the worksheet. 2. Select Window→Freeze Panes from the menu bar. menu list to view this option. set margins, and add headers and footers. orientation of the data, scaling of the area, print quality, etc. or vertically on the page. Footer (which will be displayed on the bottom of every page). drop-down menus under the Header/Footer tab. center, or right on the page. to change the font, size, and style. Page Number - Insert the page number of each page. page number to create strings such as “page 5 of 10”. Date - Add the current date. Time - Add the current time. File Name - Add the name of the workbook file. Tab Name - Add the name of the worksheet’s tab. choose a title row that will be printed at the top of each page. header and custom footer buttons. (d) Click the edit button to print the worksheet. (e) Pivot table allows you to perform data analysis. to the worksheet or Print to continue printing. To print the worksheet, select File→Print from the menu bar. 3. Copies - Choose the number of copies that should be printed. Check the Collate box if the pages should remain in order. 4. Click OK to print. You can restrict access to your workbook in three ways. Tools→Unprotect Sheet commands and click. Tools→Unprotect Workbook commands and click. from the keyboard to the mouse to execute simple commands. computer desk for a quick reference. be pressed at the same time. (c) A pasword can be upto ____________ characters long. to be printed on the page. 1. 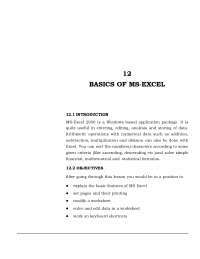 List any four applications of MS Excel. 2. What are the main features of MS Excel? 3. Differentiate between a worksheet and a workbook? 5. Explain three different ways you protect your workbook. 6. What are the three different ways you save your workbook? some other name or number? How? row, a cluster of cells, and a entire worksheet?